First, we had a nice Thanksgiving. Relatively quiet. We visited my parents and ate there. Friday, we had some friends over for Greek food. It was nice. I have started some Christmas decorating. I put lights on the column in the house and hung the stockings. Next, I want to express my condolences to a friend who lost a very young greyhound yesterday. It's tough to lose one, but I would think tougher so young. No details here, but I will say he will be sorely missed. We still have Hero. He is doing well. He has been a perfect house guest. He will be a fine greyhound for someone. He has a few quirky traits, as they all do, but overall he is a good boy. Berry White thinks he has to talk to us all the time now. He has always been vocal, but it seems like the last 2 months or so have lead to him talking more. It seems like he just fusses a lot. He wants out, he wants to be petted, he wants in the room you're in, and so on. He just barks, roos, and whines on. Goofy boy. Dax is just Dax. He is still funny about certain things, but that's just him. I have not had time to work on training him to do things as I had hoped. Hopefully, after the holidays. I just wanted to take a moment to wish everyone out there a Happy Thanksgiving! For those of you here in Louisiana with us, I hope you are enjoying our wonderful fall weather. Cold yesterday and now it's wet, balmy, humid, and warm. Ah, South Louisiana weather! I will also note, that I am trying to get into the holiday spirit, in a way other than all that darn sewing! I updated my greytalk signature today to something more, holiday-y....enjoy! If anybody wants one, just let me know. It may take me a few days, but I'd be happy to do it. Have a greyt Turkey Day everyone! First, Hero is doing very well. He has excellent house manners and seems to just go with the flow in our busy house. He is a gentle boy. I think he will end up being a snuggler. He seems to be heading that way. Last night, he got on the couch with me for a few minutes and, between T & I going to bed, he snuck in the bed and slept between us all night. We do not encourage our fosters on to the furniture, but we don't stop them either, unless we know where they are going and that it won't be allowed. Otherwise, they are treated like one of the pack. I also have decided that if he were mine, his name would likely be Mogwai, as in the little creature that Gremlins are before they become Gremlins. Anyway, I think that's what he looks like. It would be that or Mojo. I keep goign back to Mo names since he has a little mohawk. Oh well, not my place, just my opinion. The Play Day was awesome! We had, at last count, 37 greyhounds out running and playing together! It was awesome! The human company wasn't too bad either :o) Overall it was a greyt day! I think everyone, hound and human alike, had a fantastic time. It was a little cool at times, mostly when the wind was kickin', but it was fun. I have more pictures to upload to my image site and will post the link when I do. So, I think it came out pretty nice. Color could be used in place of the gray sometimes, which could be neat. Maybe I do red and green for Christmas or something. As for the name, this actually holds a good bit of meaning. First, Bauhaus. I will utilize Wikipedia to get a concise definition for those of you unfamiliar with it. So Wikipedia says, "Bauhaus ("House of Building" or "Building School") is the common term for Staatliches Bauhaus, a school in Germany that combined crafts and the fine arts, and was famous for the approach to design that it publicized and taught. It operated from 1919 to 1933. The Bauhaus school was founded by Walter Gropius in Weimar. In spite of its name, and the fact that its founder was an architect, the Bauhaus did not have an architecture department during the first years of its existence. The Bauhaus style became one of the most influential currents in Modernist Architecture and modern design. The Bauhaus had a profound influence upon subsequent developments in art, architecture, graphic design, interior design, industrial design, and typography." I have had an interest in and appreciation for this particular realm of design for a while and appreciate the works of many that arose from the school and related movements. This is not a blog about design, so I will NOT go into detail about the movement, who and what I like, etc. So, in case you also are not aware, T (my husband) and I both work in the field of architecture and I have a degree in Art History as well. Design culture runs deep in my house. I designed our house. When we moved in, T decided it had to have a name. I am not sure how long it took to come up with it (months I think), but we wanted it to reflect us. 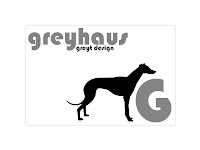 We eventually came up with Greyhaus, which tied together greyhounds, architecture and a little play on words. So, yesterday, the voters of Massachusetts passed a ban on greyhound racing. There are two tracks in that state that will be affected over the next two years. One of the tracks is not currently open and only runs seasonally. The anti-racing people are very excited and hope to move more states to a ban on greyhound racing. I am not anti-racing. I believe that the racing is not the problem. Yes, accidents happen. Dogs are injured and some die on the track or from injuries sustained on the track. It is true. BUT, that is not the problem in my opinion. I am more worried about what happens when their career is over and how they are treated off the track. I think the answer is not to ban racing, but to regulate it more. Make the tracks safer. Hold people responsible for the care of the dogs during their careers and make sure NO greyhound is needlessly put down when their career is over. More oversight. What would happen to the breed if there were no more racing? How long before there were no more greyhounds that needed to be rescued (or very few at least)? I'm sure there would always be coyote hounds, but what about all the others? What about the breed in general? Would the just become just some other dog breed, because right now I think they are pretty damn special? I pose those questions to the anti-racing people out there. YES, some people are bad. YES, bad things happen to some dogs, BUT many owners are honest, caring, and trustworthy. I have met many owners through Greytalk that do a fantastic job taking care of their hounds throughout their careers and afterward. I like to hope they are the rule rather than the exception.